MariBeth is a very old fashioned girl. She is petite, and oh so pretty, but very demure. MariBeth takes a great deal of pride in her appearance. Pink is her favorite color, but she doesn’t like to flaunt it. She prefers to accent her pinkness with other pastel colors. Oh, and she loves a bit of white lace or a demure ruffle. She really likes to perch herself on one of grandmother’s doilies. MariBeth is crocheted with a variegated acrylic yarn in shades of white, pale pink, baby blue, mint green and pale yellow. 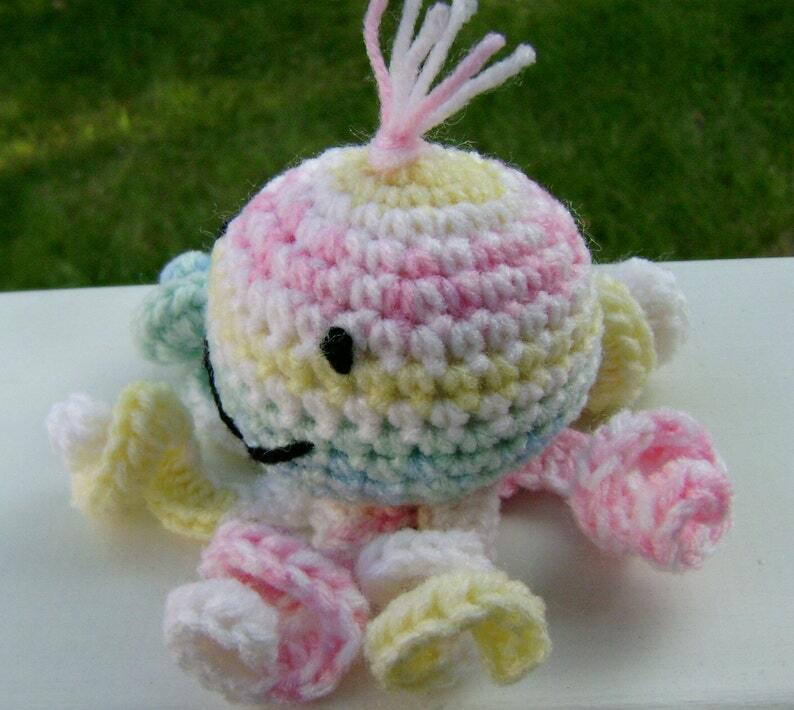 She is made with one continuous skein of yarn, so there are no pieces sewn on that little hands can pull off. Her black eyes and sweet smile are embroidered with yarn. MariBeth is firmly stuffed with polyester fiberfill. She is a little bit smaller than most of my octopi at 3 inches (7 1/2 cm) tall, not including her topknot, and measures 5 inches (12 1/2 cm) wide, from tentacle to tentacle when seated. MariBeth was hand crocheted by me in a smoke free, pet friendly home, using a design by Sue of HappyWhosits. Please note that the placement of the colors on your MariBeth may vary from the pictures. Care instructions: machine wash, gentle cycle in a hosiery bag or pillowcase with mild detergent. Machine dry on low, or allow to air dry. Shipping: MariBeth will be shipped via USPS First Class Mail with delivery confirmation to customers within the US. International customers, including Canada, will receive their octopus via USPS International First Class Mail (delivery confirmation where available). Any duties or customs fees are the responsibility of the purchaser. I combine shipping to get you the best rate for multiple items purchased at the same time. Other color combinations available throughout the shop, or upon request (just convo me).